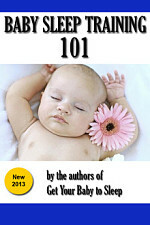 Babyproofing is not a one-time process that removes every possible hazard. It’s a continual battle, a war of attrition as babies discover new dangerous and/or forbidden things in your house as fast as you can remove them. 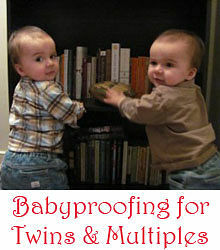 With twins, proactive babyproofing is critical, because there’s twice as many searching eyes and probing fingers. As soon as they start crawling, they can and will team up against you. I swear that there have been times when one of my boys creates a distraction in one room while the other goes for an unattended laptop, iced tea, or unzipped purse. With multiples, nothing is safe! Here’s a guide to babyproofing as much as you can. Loose items in the crib. The American Academy of Pediatrics takes a strong position on this one. The baby should be the only thing in the crib. Swaddling is fine, but no loose blankets, pillows, stuffed animals, crib bumpers, or anything that could prevent air flow. Anything they can reach from the crib. Even before they can crawl, babies are able to scoot around in the crib. They can and will grab anything outside the crib that they can reach. Watch for loose curtains, miniblind cords, electrical cords, and choking hazards. Secure any heavy objects that might tip over and fall into the crib. Climate control hazards. Maintaining a comfortable ambient temperature in the nursery is an excellent idea, but use extra caution with things that heat or cool the air. Point fans, vents, and especially space heaters away from the crib. Even from across the room, a space heater directed right at a crib will turn it into an oven. We live in a world ruled by electricity, which creates all kinds of potential dangers for babies. I’m sure you already bought outlet covers, but that’s just a starting point. Unused outlets are easy to cover up. What about things that must remain plugged in? At 12 months, my boys were crawling, sitting up, and quite capable of unplugging things like lamps and televisions. 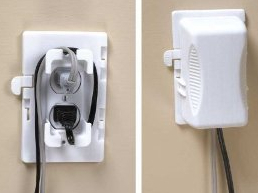 Luckily, there are outlet plug covers like the one from Kidco (pictured at right) that secure plugs and keep outlets safely covered up. See how the cord wraps around on the inside to prevent the plug from being pulled out? While we’re at it, watch for dangling cords of any kind that could present a strangulation hazard: Mini-blind cords, curtain tie-backs, and too-long electrical cords. Rubber bands, twisty-ties, and tape can be used to secure these tightly out of reach. Power strips and surge protectors are common in the household these days. They accommodate the power needs of all of your entertainment devices (TV, DVD player, DVR, etc.) and theoretically protect them from electric surges. Usually they’re crammed with an octopus of cords and a glowing orange or red light on the power button. Lots of things to catch your baby’s attention. 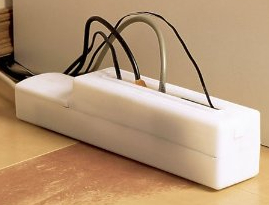 A power strip safety cover is advisable if your power strip is less than 4 feet off the ground. It works both ways, too: your electronics might need protection from your baby. No one wants to see the DVR unplugged in the middle of recording your favorite show! Small metal objects, like coins, keys, and screws from baby furniture. It might have been on the floor two seconds or five years. They’ll find it. It’s not just on the floor, either. Under couches, on coffee tables, in drawers that aren’t locked. Toys for older kids: marbles, Barbie brushes, Legos, etc. These require constant sweeps, because usually there’s an older sibling always scattering them about. Fallen food, especially popcorn, grapes, berries, seeds, and nuts. They’ll be able to eat these things eventually, but not now. They’re worrisome because your little ones see you eating them, and know that they’re food. Your home has many physical dangers for babies, especially those crawling, pulling up, or walking. Even rolling over can be a dangerous new talent for your baby when practiced on the diaper changer or another place off the ground. At our twins’ 6 month checkup, our pediatrician went out of his way to caution us about the dangers of falls. Stairs are a particular danger. Most parents know this, and take some steps to block access to these areas. 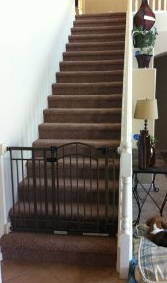 That said, if the gate isn’t correctly installed/latched/positioned, your little ones will get around it. For this reason I highly recommend investing in good baby gates. We have two of Summer Infant’s walk-through baby gates pictured at right. I like them because they’re pressure-mounted (so you don’t have to screw them into a wall) but include a gate that you can walk through. Padding the edges and corners of tables, fireplaces, steps, and other things with sharp edges. Always using the safety belt/restraint in strollers, high chairs, Bumbo seats, diaper changers, and other places from which a baby could fall. Installing child-safe locks on drawers, cabinets, and doors, especially if they open to cleaning supplies, sharp objects, or outside. Reducing access to hard-to-babyproof rooms such as bathrooms (by keeping the door closed). That covers them up through the crawling stage. Keep in mind that you’ll have to do a lot more when they learn to walk (see our article on toddler safety for boys). If you have more suggestions, I’d love to hear them in the comments section! Someone on Reddit made a good comment about baby gates – they might not withstand a coordinated assault from both of your twins. So pick out a sturdy one! Should Twins Share A Crib?